Watch Jewelpet Kira Deco! full episodes online English Sub. Synopsis: In the Legends of Jewel Land, the Jewelpets were born from the love and caring of their queen, Jewelina. However a strange meteor crashes into the Mirror Ball, destroying it into a million pieces and its fragments called “Deco Stones” were all scattered in Jewel Land. In the present time, Ruby, a dimwitted Rabbit Jewelpet and owner of the Kira Kira Shop, has a thing on sparkly decorations and loves to collect anything that sparkles and shines. However, when she and the others learn about the legend of the Mirror Ball and the Deco Stones, they all decided to go and search for them, until they all meet 5 strange individuals called the KiraDeco 5. 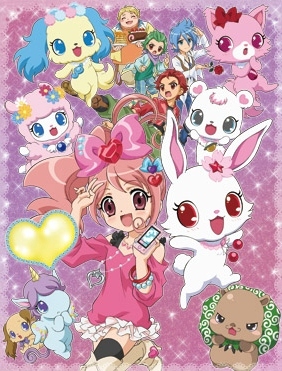 The group also has the same goal on wanting to collect the Deco Stones and they befriended the Jewelpets, especially to one of their members: Pink Oomiya. Now, the group need to gather all the Deco Stones and stop the Eternal Darkness from taking over the human world.